The Lightning Maroon is a naturally occurring designer clownfish. They exhibit unique patterns that resemble lightning bolts. Their coloration will darken, and the patterns will often intensify as the fish matures. This variant of Premnas biaculeatus is only rarely found in the wild. 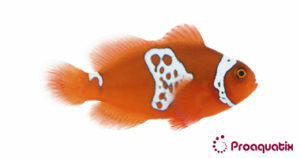 Like all clownfishes, Premnas biaculeatus is a sequential hermaphrodite. The largest individual present will exert dominance and become reproductively female. The next largest fish will become reproductively male. The female will not tolerate other smaller individuals.